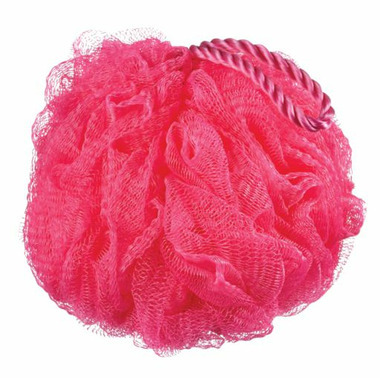 This fresh, fun and flirty body sponge creates a sudsy lather when used with shower gel. It cleans and gently exfoliates for soft, smooth skin! Assorted Colours available. You may receive a different shade of pink or white than pictured above. This is definitely one of the roughest poufs I have ever used. My skin is very sensitive so I need a very soft pouf for a gentle scrub...too harsh for my liking. It is soft. The colour is nice. I think I can use it for some time. A pretty standard body buffer which is good for the price. I really wanted the pink thatâ€™s featured on the photo but I got blue (still nice). It does say assorted colours but it would be nice to be able to choose. Been using it for a few weeks and it hasnâ€™t started to come apart yet so Iâ€™m hopeful it will last a while. Call me crazy, but I've never enjoyed using these to scrub my body. In spite of the stated purpose, I have always use them to clean the tub without scratching it - and for that purpose, it is my favourite tool to use.